Multiple factors related to your biology and lifestyle can tip the system out of balance and trigger the development of heart disease. The earliest changes typically start in childhood or adolescence and then silently progress for years before producing changes that can be seen in diagnostic tests or symptoms that you experience. The most common type of cardiovascular disease is atherosclerosis. Among the factors causing endothelial dysfunction to progress to atherosclerotic plaque, elevated levels of the certain types of cholesterol, particularly low-density lipoprotein (LDL) cholesterol, and other lipids play a major roll. Excess LDL cholesterol is deposited on the artery walls. As a basic building block for every cell, cholesterol constantly circulates in the blood along with other substances that are vital for life. When blood levels of cholesterol, particularly LDL cholesterol, are too high, excess LDL cholesterol is deposited on the endothelial lining of arteries where special receptor cells latch on to the LDL molecules. Trapped LDL damages the cells, triggering the body’s immune system into action. As the immune system tries to remove excess lipids and repair the damage, yellow fatty streaks appear on the artery walls. Soon more circulating fighter cells, known as monocytes, enter the artery lining and transform into macrophages to gobble up more excess lipids. Other protective mechanisms such as platelets, T-cells, and growth factors for smooth muscle cells arrive and work hard to restore the damage from excess lipids. As these macrophages engulf the cholesterol, they transform into macrophage foam cells, which usually appear as yellow fatty streaks visible on the interior artery walls. The fatty streaks continue to grow and form scar tissue. When blood cholesterol levels are lower and plenty of HDL cholesterol (the good guys) is present to carry away LDL, then these fatty streaks can be halted or reversed. But when excess cholesterol and/or other risk factors such as the circulating platelets and other clotting factors and excess smooth muscles are present, the deposits typically continue growing. Through pathways not yet clear, risk factors can also help modify HDL lipoproteins so that they no longer act protectively but instead contribute to the atherosclerotic process. As the process seals off the excess lipids, it actually creates cholesterol-rich pockets covered with scar tissue. These lesions narrow the arteries and typically deform artery walls as they grow larger. Decades of time and the presence of various risk factors are required for the fatty streaks to develop into intermediate (moderate-sized, symptomless) and advanced (larger, symptom-producing) plaques. In the presence of normal mechanical forces, such as the impact of flowing blood against artery walls, and risk factors that can injure artery walls, many fatty streaks begin growing into larger deposits. More cholesterol and other lipid (fat) particles migrate into the artery walls. This happens particularly in areas where the intima of the artery has thickened, probably to adapt to mechanical forces exerted on the arteries. More and more fatty substances aren’t taken into macrophages or the smooth muscle cells; instead, they begin pooling between them. Some cells die and release their lipids into this core. At that point, a thin layer of intimal tissue has begun forming a cap to contain this lipid pool. Other substances such as cytokines (various small proteins active in the immune system) and growth factors may also play a role in forming the cap and helping it continue to grow. The formation and growth of the cap mark the transition from intermediate lesions to what medspeak terms advanced (and typically more dangerous) lesions. As plaques continue to grow, they reach a condition and size that may produce symptoms such as angina, unstable angina, or even heart attack or stroke. The various advanced types of atherosclerotic plaques are characterized by a well-defined lipid core that is contained by a cap composed of layers of smooth muscle cells and other substances. At first this cap appears to be nearly normal intimal layers. But as the plaque grows larger, the composition of the cap’s layers changes, becoming more fibrous, or scarlike, as substances such as collagen and calcium enter the mix. Some advanced plaques are stable, but others are vulnerable to cracking or rupture. When a crack or tear occurs, the lipid core is exposed to arterial blood from which sticky platelets may trigger the formation of a blood clot intended to repair the break. The clot, however, enlarges the size of the plaque. 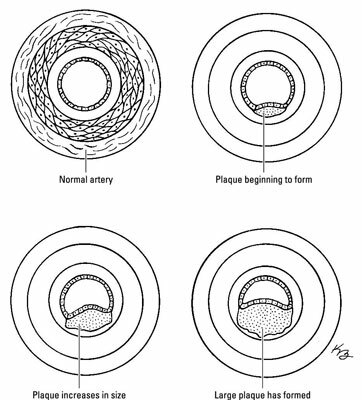 Some plaques grow larger by a cyclical process of cracking and clotting, which gradually narrows the artery. Fewer plaques may grow by a process of cap erosion rather than rupture. The plaques that are more vulnerable to cracking are more likely to form a clot that totally blocks the artery and causes a sudden event such as a heart attack or stroke.